We report patent-pending mixtures and methods for producing masonry blocks using gypsum drywall waste and preliminary investigation of Drywall Waste Block (DWB) engineering properties. Recycling waste from building construction and demolition (C&D) provides many environmental and economic benefits. However, challenges remain for recycling certain low-value C&D materials, such as gypsum drywall waste, and there are few uses for drywall waste from demolition, which constitutes the majority of the drywall waste stream. Recycling drywall waste is desirable as this waste produces noxious hydrogen sulphide gas in landfill conditions, resulting in bans on landfilled drywall waste in some localities. Investigation of compressive strength and water absorption of DWB specimens is described, and results are compared to specifications for concrete masonry units (CMU), and other comparable masonry blocks. Water reallocation is an important means to ensure that water resources are applied to the best and highest valued uses, within agriculture and across competing uses. Water markets can be powerful tools to facilitate this reallocation and increase the productive value of water. While water market activity is increasing in certain locations across the western United States, water markets are currently hindered by multiple information-related constraints and transaction costs that limit market efficacy, and can even exacerbate resource misallocation relative to no market at all. We introduce a conceptual framework to mitigate these constraints and improve water use efficiencies by capitalizing on three synergistic emerging technologies – improved seasonal water forecasting, automated consumptive use monitoring, and “smart” markets for leasing and trading water. The framework also considers the technology-institution nexus which is critical for identifying barriers to adoption, how they may be overcome in complex environments, and critical system interdependencies. Ultimately, the framework facilitates the assessment of the value of technology adoption and institutional changes for improving water use and its economic benefits. 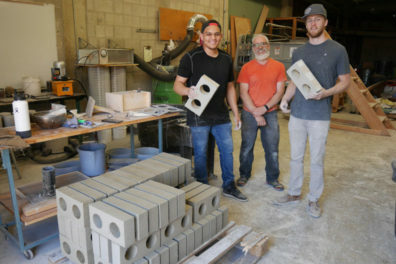 The Rural Communities Design Initiative (RCDI), a multi-disciplinary team of students and faculty in the School of Design and Construction (SDC) at WSU, developed through an interactive community-driven design approach, site feasibility studies for the Sauk-Suiattle Indian Tribe (SSIT) near Darrington, Washington. Next steps in this iterative process are to explore the methodologies need in the investigation of energy-efficient housing design as well as the type of design team required to address the issue in an integrative manner. This poster documents the methods used to assemble this team and has been funded through a seed grant from the Integrated Design + Construction Lab (ID+CL) at WSU. Programmatic information from previous community workshops will guide the investigation of new housing by considering multiple built environment alternatives. Research methods utilizing ethnographic studies, survey and focus groups, were and will continue to be used to observe and document the tribal members’ built environmental needs. Additionally, case studies and evaluations may be utilized to survey approaches to energy-efficient housing used by other northwest tribes. Digital models, as well as full-scale energy-efficient working models, will test the effectiveness of different approaches and estimate future reductions in energy consumption. These investigations will build upon relationships internal and external to the university with the intent of working with design-build organizations for site development and housing construction. The results will also be used to submit for additional grant funding from external agencies. Rapid human population growth and development combined with climate change have placed increased stresses on water, energy and agricultural resources. Concerns over food, energy and water security and the need to be able to withstand future disturbances and shocks (i.e., resilience) require careful management of these resources. Coordination increases effective storage of the overall system and enhances buffering against shocks at multiple scales (e.g., heat waves, droughts, long-term snowpack declines). Coordinated management also can be augmented with innovations in technology (e.g., smart systems and energy storage) and institutions (e.g., economic systems and water law) to further increase system-wide resilience. The overarching objective is to identify and examine effective strategies that co-balance benefits and increase resilience across integrated FEW systems through coordinated management of FEW storage systems in concert with technological and institutional innovation. This project will use a tightly-integrated, interdisciplinary approach that spans a continuum from conceptual to concrete. The regional testbed is the Columbia River Basin (CRB) comprising portions of seven states in the U.S. Pacific Northwest, and a portion of Canada. The CRB is an ideal location to apply resilience assessment of FEW systems given rapid changes in climate and human populations, complex interactions between physical, biological, and human systems, governance challenges associated with transboundary issues, and international perspectives. The approach is to develop a transferable framework involving 1) a theoretical foundation characterizing the FEW system within the region that is generalizable to national and global scales, 2) integration of state-of-the-science models to capture FEW system interactions, 3) evaluation of FEW innovations (identifying ancillary benefits or unintended consequences) using the modeling platforms, and 4) a two-way stakeholder engagement approach to develop new strategies and to remove barriers to adoption of strategies. The World Health Organization estimates that the production of pharmaceuticals is a $300 billion industry, with an estimated increase of $100 billion over the next three years as new pharmaceutical products become available. With the advent of new pharmaceutical products and the desired synthesis of more complex products, an emphasis has been placed on the development of molecular catalysts that are capable of promoting selective chemical transformations. Increased restrictions on selective chemical transformations used in the generation of pharmaceutical products have emphasized that there is a critical need for the design of new catalysts capable of tunable reactivity for the promotion of chemical reactions from a mixture of different building blocks. We hypothesized that the incorporation of a fluorescent dye molecule into a catalyst scaffold would result in catalyst molecules that exhibit unique functionalities and the ability to switch “on/off” their catalytic behavior when exposed to external stimuli. This presentation will describe the synthesis and reactivity of fluorescent dye containing molecular scaffolds, in addition to molecular catalysts. The presentation will also emphasize the results describing the ability to alter the catalytic activity of fluorescent dye containing molecular catalysts upon the addition of an electron or when illuminated. The generation of a molecular catalyst that is capable of exhibiting switchable catalytic activity when exposed to external stimuli will result in the reduction of energy requirements of chemical processes and lead to an increase the safety of pharmaceutical products. Drought affects millions worldwide. Understanding public attitudes about water shortage and the influence of media frames can guide public policy and effective risk message development. An experiment was conducted to examine how framing drought as a risk to public health versus a risk to the environment may influence risk perceptions. Results show framing drought as a health risk produced lower intent to conserve water and there was no significant difference in level of concern between the health and environmental frames. Negative impacts were perceived as being more likely to affect distant populations than local populations. The findings demonstrate how the framing of drought may influence risk perceptions and intentions to take mitigating action. This paper presents an analysis of systems thinking interventions in an educational setting. Although these interventions have been implemented in classrooms since the 1980s, there is still no clear understanding of whether or not the use of systems thinking interventions are effective for all types of learners. The goal of this paper is to answer the question: how can we best implement systems thinking interventions in educational settings while considering an individual’s learning approach? This question leads to sub-questions: (1) what are key components and tools of systems thinking (2) what systems thinking interventions work for different types of learners, and (3) how can the effect of different systems thinking interventions be measured for different learners? The purpose of answering these questions was to propose a method for implementing systems thinking interventions so as to meet all learning approaches within the classroom. The analysis of systems thinking acquisition, when mapped with individual learning approaches, yielded an initial set of guidelines for instructing and increasing a person’s level of systems thinking skills. Mountain pine beetles are the most damaging bark beetle species in Western North America. It is anticipated that in the future, with climate change, the bark beetle outbreak will be more severe and frequent. Bark beetle are devastating forests in numerous locations, changing the forest canopy and the local water and energy cycle. The beetle caused canopy changing can affect the interception of precipitation and solar radiation, wind speed, snow melting and canopy evapotranspiration. In western US, mountain snow is the primary source of water. Understanding the hydrologic response to beetle outbreak in these regions is important for future water resources and forest management. In the first few years after infestation (red and grey phase), the evapotranspiration will decrease, ground snow accumulation will increase, and more radiation will cause earlier and faster snowmelt. On the other hand, the ground evaporation and sublimation will increase, and understory will grow faster and consume more water. These responses are affected by elevation, slope and aspect, counteracting with each other and causing the streamflow may increase or decrease. The topographic controls on hydrologic fluxes after beetle infestation is not fully understood. In this study, we will use a fully distributed ecohydrologic model (RHESSys) to study the spatial pattern of responses to different beetle attack mortality (15%, 30%, 60%, 90%) across different elevations and aspects. A paired model method (complex and simple) is used to find out how much spatial variation in response to beetle attack can be attributed solely to the primary physical effects. A simple model is that all the patches have the same soil type, vegetation, LAI and slope, only the elevation and aspects are different. Our central hypothesis is that aspect is the main physical factor that control the streamflow increase or decrease. Exposed slopes can increase snowpack sublimation and soil evapotranspiration, then reduce streamflow. The shaded slopes with limited transpiration and snow sublimation, will have no compensatory response from understory, thus will cause streamflow increase. Insufficient water supply for irrigation in the Pacific Northwest region of the USA is a major issue due to seasonal mismatch between precipitation and the growing water demand in food, energy and water (FEW) systems. Disturbances and shocks, such as drought or flood, increase the challenges of optimizing water allocation across the FEW systems. Managed aquifer recharge (MAR) is an innovative method to store water from the snow melt season as groundwater and pump for irrigation during water scarcity periods. MAR can be an effective way to buffer other unexpected disturbances and improve the reliability and security of FEW systems. We developed a generic water storage-focused structure for FEW systems with System Dynamics (SD) modeling, which is a practical method to gain insight in understanding interactions and feedbacks of complex systems. The dynamics of water allocations among FEW sectors are driven by water demand, available water storage, water rights, flow rules and water storage management. The SD model considers MAR with a diffusion mechanism to represent feedbacks of adoption behaviors for innovation applications. Scenarios of different climates with extreme dry and wet events were selected for evaluation of the effectiveness of MAR. We evaluate the SD model behavior to understand the impact of alternative MAR to reliabilities of both the food and energy systems. The assessment of sensitivities of variables to MAR informs its effectiveness in different scenarios of irrigation districts related to irrigation, cropping and management systems. Sedimentation is an important issue for most rivers and reservoirs especially in watersheds with extensive agricultural or wildfire activity. These human and natural induced disturbances have the potential to increase runoff-induced erosion and sediment load to rivers; downstream sedimentation can decrease the life expectancy of reservoir and consequently the dam. This is particularly critical in snowmelt-dominant regions because, as rising temperatures reduce snowpack as a natural reservoir, humans will become more reliant on reservoir storage. In the Northwest U.S., the Columbia River Basin (CRB) has more than 60 dams, which were built for irrigation, hydropower, and flood control, all of which are affected by sediment to varying degrees. Determining what dams are most likely to be affected by sedimentation caused by post-fire erosion is important for future management of reservoirs, especially as climate change is anticipated to exacerbate wildfire and its impacts. The objective of this study is to create a sedimentation vulnerability map for reservoirs in the CRB. There are four attributes of a watershed that determine erosion potential; soil type, topography, vegetation (such as forests, shrubs, and grasslands), and precipitation (although precipitation was excluded in this analysis). In this study, a rating system was developed on a scale of 0-90 (with 90 having the greatest erosion potential). The different layers in a Graphical Information System were combined to create an erosion vulnerability map. Results suggest that areas with agriculture have more erosion without a wildfire but that forested areas are most vulnerable to erosion rates following a fire, particularly a high severity fire. Sedimentation in dams is a growing problem that needs to be addressed especially with the likely reduction in snowpack, this vulnerability map will help determine which reservoirs in the CRB are prone to high sedimentation. This information can inform managers where post-fire erosion mitigation efforts might be prioritized. Pervious concrete (PC) pavements are used for stormwater management and flood mitigation. However, the highly porous macrostructure of PC results in low mechanical properties compared to portland cement concrete (PCC) pavements. Cured Carbon Fiber Composite Material (CCFCM) is heavily used in manufacturing of high-performance products. Therefore, large quantities of excess CCFCM materials are generated, requiring proper disposal and reuse applications. In this study, recycled CCFCM were used as discrete structural reinforcement in a PC pavement demonstration project. In addition to one Control section, two pavement sections were paved using PC mixed with 0.27 and 0.40% volume fractions of CCFCM, respectively. Field cores and cast specimens from CCFCM-PC mixes achieved similar 7 and 28-day flexural, tensile, and compressive strengths to the Control, although their porosity was higher. Furthermore, CCFCM-PC sections had higher infiltration rates than the Control. Using lightweight deflectometer load testing, CCFCM-PC pavement sections showed lower surface deflection than the Control under the same applied load. Based on these findings, CCFCM was successfully implemented as reinforcing elements in PC, providing an environmentally-friendly solution to recycle this material. Glass Fiber Reinforced Polymer (GFRP) composites from end-life wind turbine blades were resized into various size elements. After recycling, resized GFRP are incorporated as reinforcement in mortar mixes. The incorporation of GFRP as reinforcement in cement systems is innovative and green, which improves the engineering performance of the reinforced mixture compared to traditional cement systems. GFRP fibers positively contribute to the post-crack behavior of the mortar system and make mortar lighter in weight. This research is intended to develop GFRP resizing protocol, optimized mixes and performance database for the targeted application. Nitrogen (N)-fixation is the dominant natural source of N in Pacific Northwest ecosystems, but low N<sub>2</sub>-fixation rates result in N limitations to net primary productivity. However, anthropogenic emissions of N have increased globally due to agriculture and burning of fossil fuels. Long term N deposition has adverse effects such as eutrophication, soil acidification, and loss of biodiversity. In Pacific coastal ecosystems, epiphytic lichen communities are a dominant source of N<sub>2</sub>-fixation, but exceedance of the critical load of N from deposition may decrease N<sub>2</sub>-fixation by epiphytic lichens. Here, we test the hypothesis that atmospheric N deposition from anthropogenic sources is decreasing N<sub>2</sub>-fixation by the cyanolichen, <em>Lobaria oregana</em>. We tested the hypothesis by measuring the N stable isotope composition (d<sup>15</sup>N) of herbarium lichen specimens from 1899 to current day. A d<sup>15</sup>N of 0 ‰ indicates N<sub>2</sub>-fixation, negative values represent agricultural emissions while positive values indicate N originating from fossil fuel emissions. Lichen d<sup>15</sup>N suggests N<sub>2</sub>-fixation was the dominant source of N until the 1970’s. A large increase in d<sup>15</sup>N in the 1970’s corresponds to the completion of I-5 and rapid development along the I-5 corridor. Lichen d<sup>15</sup>N values that correspond to fossil fuel emissions have steadily increased to present, but large spatial variation exists due to localized sources. This suggests that over the short term, anthropogenic N deposition is causing a decrease in N<sub>2</sub>-fixation by <em>Lobaria oregana</em>. The long term consequences are a likely shift from N sensitive, to N tolerant species. This work evaluates an apple pomace-based inhibitor that was prepared through a zero-waste chemical/biological process, which holds promise for mitigating chloride and corrosion-induced impacts on the environment. Electrochemical measurements suggested the outstanding corrosion inhibition efficiency of 98.8% for this solution on C1010 steel in NaCl solution. Mass spectroscopy analysis revealed the compounds of this renewable corrosion inhibitor. Surface analyses elucidated the characteristics of the steel surface. The main corrosion inhibitor agent in this agro-based liquid mixture that adsorbs onto the steel surface as a barrier phosphate layer, and blocks anodic active sites. The adsorption of the extract molecules followed the Langmuir adsorption isotherm through physical adsorption. Quantum chemical calculations suggested a physisorption mechanism for the adsorption of C26H50NO7P molecules on the metallic surface. This paper applies Machine Learning (ML) to predict the customers’ stated willingness to buy an Electric Vehicle (EV) in South Korea, particularly for customers who have already experienced riding in an EV. The data for this study stems from a survey conducted by the Korea Energy Management Corporation over October 1–31, 2013. With this data set, the paper specifically demonstrates ML approach to predict the stated willingness of buying EVs from Korean customers and binary logistic approach to know who would be willing to buy an EV, based on 53 independent variables. In the case of ML, Ensemble methods, Random Forest and Ada Boost, were conducted. In addition, to improve the prediction performance of both ML methods, Bayesian Optimization was used for tuning hyper-parameters. As a result, Ada Boost’s 5-Fold Cross Validation Accuracy was increased by 7% more than that of L2 regularized binary logistic regression. In this regard, ML can be used to apply diverse classifiers, tune the best parameters, and find the best models among classifiers rather than stick to a small number of classifiers. Above all, the growing market has a high uncertainty with the small size of consumer data such as EV market also can be benefit from using Machine Learning to predict consumers’ behaviors. A changing climate and an increasing population heighten the need for understanding global freshwater availability and temporal variability. While prior studies have examined surface water fluctuations, they have primarily focused on riverine and subsurface systems. Here we present a synthesis of lake surface area change for nearly 1.4 million lakes from 1995-2015 paired with basin-level temperature, precipitation, and population data. This data product combines lake and watershed locational data with the JRC Global Surface Water dataset to obtain annual surface areas for individual lakes. Yearly basin-level temperature and precipitation data were derived from MERRA-2 reanalysis data. Population data came from the Gridded Population of the World dataset. This dataset maintains unique identifiers to encourage research questions related to lake morphology and hydrology. This dataset can be used in quantitative investigations at local, watershed, regional, and global scales. Lakes are integrations of both surface and subsurface connections. Recent studies have investigated riverine and subsurface water quantity over time, yet lake water quantity may be distinct. Using remote sensing observations, we calculated the surface area of permanent and seasonal water for nearly 1.4 million lakes from 1995-2015. The direction and rate of lake area change was highly variable, though the overall trend was an increase in lake area. Regionally, polar lakes showed a more rapid increase in area, whereas many lakes in Central Asia, India, North America, and Australia showed decreasing trends. Regions with decreasing lake areas over the period tended to have increased interannual variance, while regions with increasing lake areas showed decreasing interannual variance. This study provides a new global perspective on lake area changes to better understand future linkage between lake dynamics and water quality, human use, and ecosystem function.